Despite the iratedepressedexhausted somber mood of women’s advocates lately, U.S. brands like Mattel and Dove are gearing up to celebrate the International Day of the Girl, Oct. 11. With ads and content aimed at encouraging education, career-role models and mentoring, they hope to bring awareness to the many ways the world discourages its young females. A launch video stars a handful of adorable kids reading parents the riot act about the many ways they inadvertently undermine daughters: They are twice as likely to Google “Is my son gifted?” than they are “Is my daughter gifted?” for example, and far less likely to give girls science-related toys. BBDO San Francisco is the agency, and a Mattel spokesperson tells Marketing Daily the video is running on YouTube and other digital and social platforms. And the brand, which generated plenty of buzz with the launch of its “Inspirational Women” collection earlier this year, including fencers, boxers, snowboarders and artists, says it plans to highlight at least 10 “empowering female” role models around the world each year. 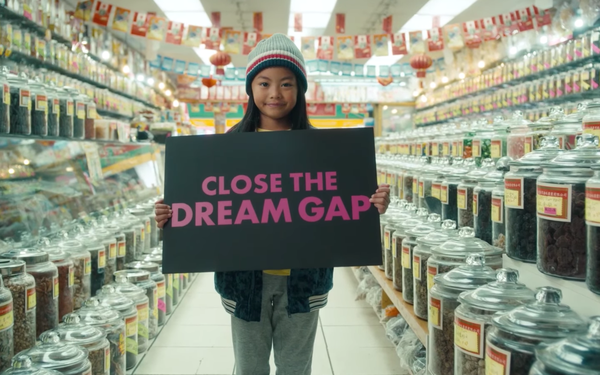 "The goal of The Dream Gap Project is to leverage Barbie's global platforms to educate society on gender biases and inspire any supporter of girls to join us, as we can't do this alone,” says Lisa McKnight, general manager and senior vice president of the Barbie brand, in a statement. Unilever’s Dove is debuting The Girl Collective, “a sisterhood on a mission to raise the self-esteem of girls everywhere,” with a vow to reach an additional 20 million girls with messages “that can protect them from the outside voices that influence how they feel about their appearance.” Shonda Rhimes, the filmmaker who has been partnering with the brand on Real Beauty Production videos, hosted the kickoff event on Facebook Live.